Released in 1969 in the last days of the hippie era, Black Sabbath`s debut had definite roots in what had come before, but was a major change in tone. Although heavily influenced by Cream and the blues, the music's dark tones and lyrical themes certainly set Black Sabbath apart from their peers. From the spooky title cut to the ending Wicked World, this album is a lot like a chilling trip through the old "haunted house" ride, with a wonderful soundtrack. 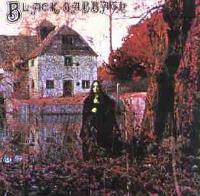 Black Sabbath is Tony Iommi, Geezer Butler, Ozzy Osbourne and Bill Ward. The sounds of a storm and a tolling bell ominously start off the album. A wonderfully creepy tale unfolds complete with appropriately ominous music. This mode creates the focus for the majority of the piece, up until the final fast paced metal riff-driven segment that takes it out. This cut can certainly send chills down one's spine under the right circumstances. This brief instrumental is the first appearance of a triumphant sounding metal style that would eventually become a Sabbath mainstay. Based firmly on a dark and heavy sound, this also includes the aforementioned triumphant sounding mode. It showcases a very strong guitar solo, and closes with drums that lead into Bassically. Bassically is one of the stronger bass solos on any album, based on its flavor and style. It really shows just how potent of a musician Geezer Butler is. Intriguing acoustic guitar in a somewhat spooky vein is accompanied by juice harp. This entire segment is haunting and considerably effective. The next segment begins with more trademark Sab sounds, first the triumphant, then the slower and more heavy. This leads to a short percussion solo. The percussion is then joined by bass following by guitar creating some wonderful cross-riffing interplay in the twin guitar attack. This then goes back to the more heavy chord driven segment. Then the cut moves to a wall of guitar sound. This is a strong groove oriented, bluesy segment. "I was born without you baby, but my feelings were a little bit too strong." This is an extremely tasteful hard rock number that calls to mind Cream and really shows off Iommi's guitar prowess. As this segment ends, it leads to some strong guitar riffing over drums that leads into a nicely metallic free form jam segment. Another riff mode jumps out of that one, this is a very strong blues rock jam. This whole instrumental section is very strong. Becoming a wandering freeform jam, this covers a lot of musical territory, alternating between bluesy, mellow and evocative, and hard rocking. It even moves into the weird and spooky. The cut then jumps to a strong rocking Sab segment that leads to more moody guitar line, then taking the song back to earlier segments to end the piece. The strong riff driven intro features major hard rock jamming from all three instrumentalists. As the next movement of the song begins, it is in the form of more chord driven, somewhat bluesy Sabbath mayhem. This song has so many musical changes including an evolution into a more mellow and emotional guitar segment, and a metallic guitar solo segment that is rather in the mode of Led Zeppelin. If you are a person who really appreciates guitar riffing, this cut will really work for you.